Although spiking mortality of broiler chickens is no longer a hot topic in the industry, it still is somewhat of a recurrent problem in several parts of the world. In Part 2 of this series, Angel I. Salazar focuses on lighting, feeding, and ventilation issues in preventing this malady. There are several suggestions in the literature indicating young broiler birds should be exposed to a minimum of six continuous hours of total darkness on a daily basis. Now, should this be implemented to prevent the problem or after the first signs of trouble? Dr N Dorko, from Aviagen, commented during a technical presentation, that growers still utilising lighting regimes that allow for 24 hours of continuous light or 23:1 (light to dark) should reconsider this practice. He adds there might even be some positive side effects for increased livability, yield and, reducing leg problems. See tables below. 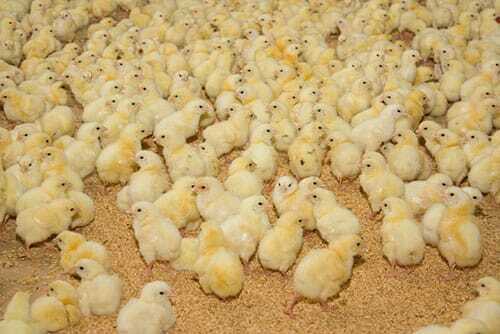 A pretty common suggestion is to leave affected chicks undisturbed in order to minimise stressful conditions. Palliatives/band aids: Administer electrolytes, multivitamin supplement to the birds via the drinking water. Field experience indicates hot summer months and concomitant stress factors seem to offer more of a window of opportunity for a higher incidence of spiking mortality. We must try and make a concerted effort to seal air leaks in all areas of the house to increase air speed in the tunnel and, ensure bird comfort. It is in our best interest to eliminate hot areas of idle air throughout the house, i.e., the two inside corners located on the cool cell pad end of the house where birds tend to gather and overheat. Properly maintain all house ventilation equipment and accessories, e.g., fan motors, fan belts, fan blades, tension pulleys/arms, fan guards, interior fan shutters, roof baffles and the like. Emergency generators must also be checked and turned on regularly to ensure they will indeed work when required during power cuts. Batteries, oil and fuel levels are all critical control points to keep in mind. Automatic curtain drops must also function and work properly when required. In tropical, hot and humid areas, one must always be on the aggressive rather than on the conservative side when it comes to proper house ventilation, specific on/off timings for the sequential stages for the battery of exhaust fans. 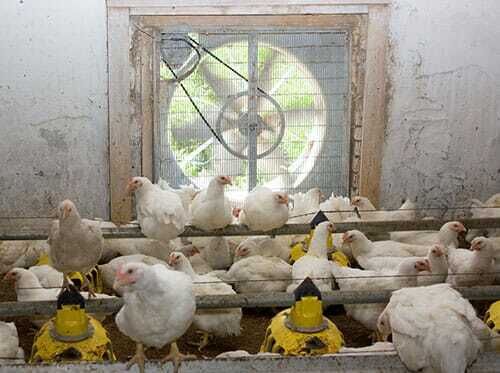 If one detects broilers panting at any time, the ventilation rate of the house must be ramped up. There must be no exceptions to this cardinal rule. Actively panting birds are stressed and spend a significant amount of energy trying to cool down, become dehydrated, are hyperventilating, drink more water, and produce watery droppings which lead to caking of the litter and higher ammonia levels. These birds are stressed, quit eating and lose feed conversion efficiency very rapidly. The higher the external relative humidity gets the more aggressive we need to be on our broiler house ventilation. Certain diet formulations have been implicated in spiking mortality as well. Especially ones containing high amounts of animal by-products sensitive to oxidation/rancidity or management errors that would lead to stress conditions (Davis, 2003). Even though broiler chickens are fed ad libitum, there is always a level of bird competition for the available feed. Thus, one must avoid lengthy interruptions of the feed supply in the feeding equipment. If we allow a low level of feed present in pans or in hanging feeders, we increase the risk of transitory bird starvation. When a significant number of pan feeders on the line go pretty much empty, the young birds invade the pans in order to gain access to the limited/marginal feed offering. In doing so, they defecate and greatly increase the level of faecal contamination of such feed. Bird droppings will dry out quickly, disintegrate, and thoroughly mix with good feed. This gray, powdery, ashy residue effectively contaminates the feed birds are consuming. Let’s just remember, there is a heavy load of arena virus particles in the droppings from affected birds. 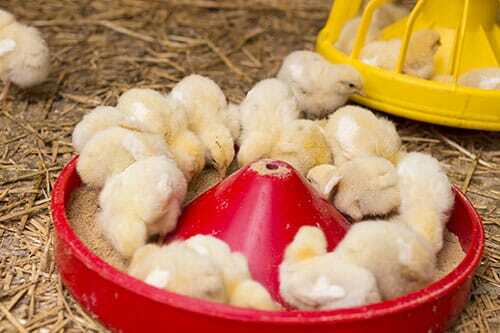 In short, there is no positive side in chicks/young broiler birds ingesting large amounts of potentially infectious materials, i.e., feed contaminated with faecal matter. Certain models and/or brands of mechanical equipment, i.e., pan-feeders work really well with crumbles and pellets but do not do such a good job with mash feeds. Frequently, one is able to observe that mash feeds do not flow into the pans with ease. Under such conditions, an extra effort is required on our part. In short, we need to practice frequent activation of pilot/control/trigger pans. Manual, daily shaking of feed pans/baskets deserves due consideration as well. This is always much easier said than done. Feed pan delivery settings must allow for maximum feed offering according to the age of the birds, while at the same time, minimising feed wastage. This requires attention to detail. One must also make sure internal feed hoppers are in good state of repair and have feed in them at all times. Thus, when feed augers in the line are activated they are fully charged and feed is actually delivered into the pan feeders. Starvation and hypoglycemia are buzz words frequently associated with spiking mortality. However, Dr. John D. Summers from the Canadian Poultry Council, points out hypoglycemia has not been shown to occur in tests with feed and water removed from chicks for 72 hours, suggesting spiking mortality, as seen in the field, is not due solely to inadequate feed intake.